The scent of Jardin de Vie agrume is reminiscent of a French garden on a summer's night. It was inspired by the scent of Sea Buckthorn, which I did not know was so beautiful smelling. It also reminds us of summer, this bright and airy fragrance was in fact inspired by the citrusy notes of the Sea Buckthorn berry with a fresh and lively composition. Made with pure essential oils this scent has been hand crafted by Weleda's in-house perfumery using only high-quality essential oils sourced directly from Weleda’s fair trade partnerships. This captivating fragrance is free from phthalates or any synthetic chemicals. The Fragrance (Parfum)is made from natural essential oils. Citral is a naturally occurring component of essential oils, such as Lemon Oil, Orange Oil, Lemon-Grass Oil and Bergamot Oil. Fragrance (Parfum)* denotes the presence of natural essential oils in a formula. Natural essential oils are health-promoting and life-preserving ingredients. Essential oils have been used for centuries for mummification processes and wound healing due to their ability to “preserve” the various plants from which these oils are a part. Natural essential oils, versus synthetic compositions, enhance our wellbeing both mentally, spiritually and physically. Essential oils stimulate our mind and body, awakening our senses and stimulating the parts of our brains that control our emotions and regulate our hormones. Physically, essential oils promote the circulation and metabolic functions of the skin and its tissues. Furthermore, almost all essential oils possess fungicidal and bactericidal properties, purifying and promoting the health of the skin. Fragrance (Parfum) from natural essential oils. Limonene is a naturally occurring component of essential oils, such as Rosemary Oil, Lemon Oil, Orange Oil, Grapefruit Oil, Bergamot Oil, Fennel Oil and Lavender Oil. The scent is made from 92% organic ingredients. This scent is exotic and captivating. It would make a wonderful gift for Valentine's Day. Any woman would love to smell this all day. Not for anyone else in mind, not this would be for herself. This fragrance is made to keep the customer happy. It is one of those new fragrances that now being made for women so that it is for them. Not to entice a man. I would not wear this to entice a man. No, this is to wear throughout the day to keep be feeling upbeat, happy and alert. The fragrances behind this scent were chosen for this purpose. This scent makes me feel happy to wear it, It makes me feel energetic, alert, upbeat, happy and alive. I love to wear it. It is a new time in perfumery. Take advantage of it. 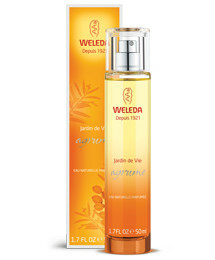 Weleda Jardin de Vie agrume is purchased online at www.weleda.com. Or at many stores, most of which are natural food store or boutiques specializing in natural skincare. Like Weleda on Facebook: https://www.facebook.com/Weleda.NA/?brand_redir=198119003432; Follow Weleda on Twitter: @Weleda; Follow Weleda on Pinterest: https://www.pinterest.com/weleda; Follow Weleda on Instagram: https://www.instagram.com/weleda_usa; Subscribe to Weleda on YouTube: https://www.youtube.com/user/WeledaNorthAmerica; Follow Weleda on Google+: https://plus.google.com/105899325370412648369.